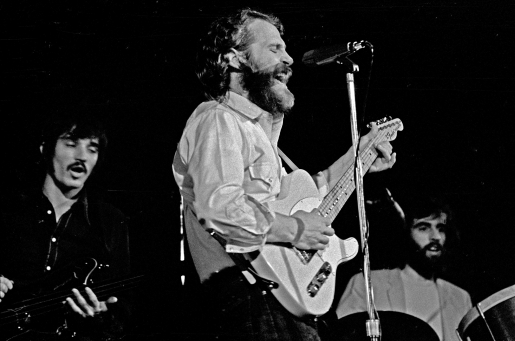 Levon Helm, center, belting out one of his world-famous songs. Man, I hate starting the day off with some depressing news, but it’s news, so here we go. Levon Helm, the drummer and lead singer who was crucial to the rock and roll hall of fame backing group The Band, isn’t doing well. After battling throat cancer for most of the 90’s that robbed him of his voice, a sad announcement was rendered. Levon Helm is in the final stages of cancer. From cutting a string of classic albums with their first three releases to backing up Bob Dylan on his genre-breaking electric world tour, this guy did all he could musically. Even after the cancer affected his voice, he hosted The Midnight Ramble, a series of legendary performances and concerts centered around The Barn in Woodstock, New York. We’re all going to die, so make sure you really live first. Levon Helm’s had an incredible life.